Cryogel® Z flexible aerogel blanket insulation is engineered to deliver maximum thermal protection with minimal weight and thickness. It is unmatched in sub-ambient, cold cycling and cryogenic applications. Available in two thicknesses, Cryogel Z incorporates an integral vapor retarder with zero water vapor permeance to ensure maximum asset protection. The extremely low thermal conductivity of Cryogel Z minimizes heat gain and liquid boil-off. It remains flexible, even at cryogenic temperatures, eliminating the need for complex, costly contraction joints, thereby simplifying and speeding installation. FEED and EPC engineers benefit from Cryogel Z’s suitability for modular and traditional stick-built construction projects; it can be applied remotely and moved to the job site. 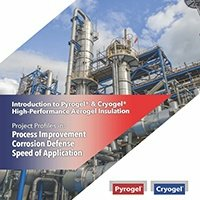 It can easily withstand sea and road transport for greater project savings.With its durable format, Cryogel Z withstands mechanical abuse and provides continued protection throughout the life of the asset—plus, its reduced weight make it perfect for legacy sphere and vessel use. Cryogel Z is ideal for both maintenance work and new builds, supporting faster and safer installations with sustained long term performance. In addition to being the first choice in cold conservation, Cryogel Z offers acoustic attenuation and protections against cold splash, pool fire, and jet fire. 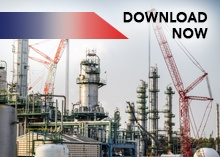 The combination of these safeguards make Cryogel Z ideal for onshore, offshore and marine applications, including LNG and ethylene gas processing, refrigeration, alkylation, and more. An LNG receiving terminal in Thailand chose Cryogel Z for jetty lines, tank interconnects, and regasification piping and equipment. Cryogel Z installation requires no costly and time-consuming contraction joints. Cryogel insulated 8000m of piping in 60 days, half the time required for a rigid foam system. 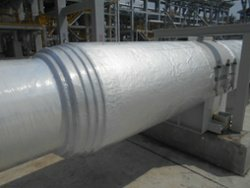 Cryogel insulation (right hand pipes) is a fraction of the thickness of rigid insulation (left hand pipes).